The RL26 remote digital display is a 6-digit LED display, with 2” high characters. Primarily used with our line of in-motion checkweighers to display each package weight at a station remote to the checkweigher’s main HMI. The RL26 is housed in an IP66 FRP enclosure, with SS fasteners. Communication between the scale controller and RL16 is by RS-232, RS-422, and 20mA current loop (active or passive). A source power connection of 120VAC or 12VDC must be provided at the remote display’s location. Power should not run in the same conduit or cable as communications wiring. A set of dip switches are used to select protocol and data string construction. 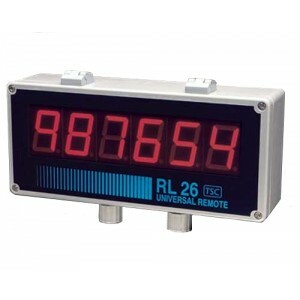 The RL26 Universal Remote Display is compatible with many types and brands of scale indicators.